A few weeks ago, when I first started using Blippy, the site that tracks my purchases offline and online, I said it simply proved how boring I am. Aiming to not itself become boring, as exciting as reading old receipts as popular funnyman Stephen Colbert recently called it, the site recently introduced two new features that will highlight user activity and popular purchased items, bringing discussions to the top. For fellow FriendFeed veterans, Blippy's move is much like increasing the visibility of active discussions on the site through "best of day". It also mirrors the recent move by Facebook to highlight popular entries from you and your friends in the newsfeed. While previously, activity on your Blippy stream would move chronologically out of the main view as you made more purchases, active threads can now be found in a section Blippy calls "Lively Chatter". Also, you can check "Popular Purchases" from everyone on the site, leveraging the increasingly popular standard of "likes" and comments. The more people you follow on Blippy, the more likely it is that you will see comments and likes in your stream. These are highlighted in "Recent Activities". 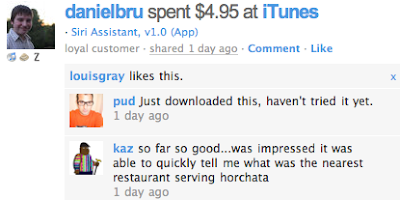 Clicking on "Lively Chatter" shows items that have gained comments (including comments from yourself), letting you see conversations about the movies and music and apps that you are buying. For now, Philip Kaplan (aka Pud), creator of the site, is the most frequent commentor in my feed, which comes as no surprise, but this may change as people grow more accustomed to making the site more of a two-way platform, instead of just simply importing. While some look at Blippy as a perfect example of oversharing or our own willingness to put personal data on the Web, I see it as a logical extension to our recommending and telling people what we "like". 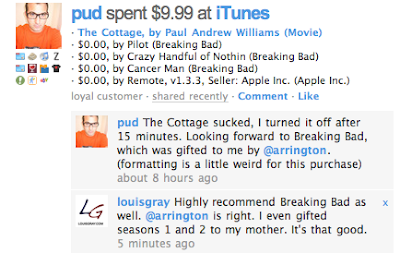 Pud, curious about the series "Breaking Bad", which popped up in Mike Arrington's stream, even had the show gifted to him due to his curiousity. I expect to see many more similar actions driven directly from activity on the site.